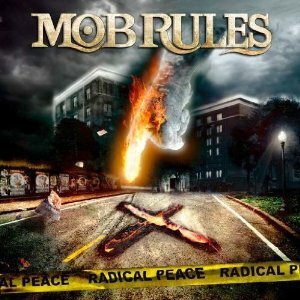 Hall of the Mountain King: Review: Mob Rules, "Radical Peace"
Germany’s Mob Rules fits in that large category of European power metal bands that have just never connected with me personally. Generally, I prefer the mid-tempo style the band employs more than the speedsters, but, despite a few bright moments here and there, I’ve largely been unmoved by their work. After draggy album opener, “Children of the Flames,” which feels like it goes on forever despite the fact that the running time is only about seven and a half minutes, I thought I was in for more of the same with their latest, Radical Peace. Things picked up with second track “Trial by Fire,” though, a more uptempo galloping piece with a big chorus. “Warchild” brings a darker mood to the record with some ominous slab guitar riffs from Matthias Mineur and Sven Ludge and very well-used keys from Sascha Onnen. Even vocalist Klaus Dirks takes the dramatics down just a notch or two on the track, making it one of the better tunes here. The folky touches on the opening of “Astral Hand” are a nice addition to a song that has a bit of a classic hard rock feel on the verse. So, first song aside, I’m liking this record when we get to the big 20-minute centerpiece “The Oswald File.” It’s a six-part concept piece centered on Lee Harvey Oswald and the assassination of John F. Kennedy. The piece blends sound clips from the era of the assassination with instrumental pieces and a couple of full songs. The set features some big metal riffing (“A Dead Man’s Face”), soft piano ballads (“Desperate Son”) and dramatic instrumental interludes (“11:30 a.m.,” “Unnecessary Doubt”). The strongest pieces are “A Dead Man’s Face,” which features a memorable hook, and the closing piece “Did You Reach the Sun?” which opens with a plaintive acoustic moment then moves through expressions of anger and back to a more reflective mood. I’m a sucker for a concept that’s done well, and while I won’t say this one is the greatest I’ve heard, it certainly gets my attention. Two more songs follow the Oswald concept piece, and both of them are pleasers. “Waiting for the Sun” takes a more typical European power metal melody, but the faster pace is needed after the somber note the previous portion of the record hit. “The Glance of Flame” returns to the mid-tempo pace but packs a catchy vocal melody. Radical Peace doesn’t radically change my view of Mob Rules, but it does give me a new perspective on the band. It’s a good record and worth a listen for melodic metal fans.